Impactful Opportunities: ThatHelps makes it easy to turn your curiosity into action through thoughtfully sourced opportunities to participate in on your own or in conjunction with friends and family. A Highly Vetted Partner Network: Rigorously vetted, these organizations are the ones our community can trust, especially in times of crisis when there is confusion around how to help. A Trusted Resource: ThatHelps educates people about the issues that inspire them by providing actionable information as well as the tools and opportunities to make a difference. 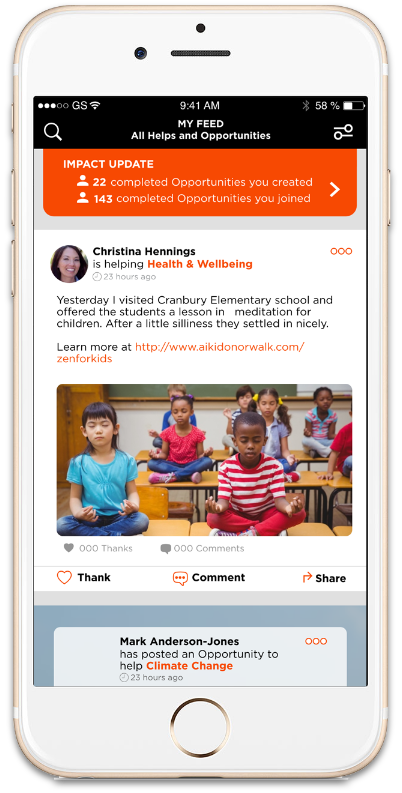 ThatHelps is an app, digital resource, and community dedicated to empowering more people to do more to help worthy causes. How do I join ThatHelps? It’s easy! Download the ThatHelps app and begin choosing Interests to follow. Relevant opportunities to help and inspiring stories will populate your personal activity feed. We encourage you to invite your friends and family to join your helping network, so you can complete opportunities together. What is an Interest on ThatHelps? There are 16 broad cause categories, from Animal Welfare to Veterans. Each Interest category is connected to a vetted partner organization and opportunities to help. What is an Opportunity on ThatHelps? An Opportunity is an event or challenge to get involved and help. Opportunities are selected and vetted by the ThatHelps team. What is the Community section? The Community section of ThatHelps.com is a snapshot of what you will find on the ThatHelps app. Download the ThatHelps app on iPhone or Android to experience an enhanced version of ThatHelps and to create your own Activity Feed, follow specific Interests, and connect to a like-minded community of helpers. How is the Partner Network vetted? ThatHelps has created a proprietary methodology that vets organizations based on quantitative and qualitative factors to determine those doing the most meaningful work worthy of support. Our vetting model assesses the efficacy and impact made by non-profit organizations through extensive reviews of quantitative materials like annual reports, operations, and financial rankings from sources including Guidestar, Better Business Bureau, the Wise Giving Alliance, and Charity Navigator. We examine each nonprofit’s effectiveness and transparency with regard to fundraising efforts, tax and income filings, executive compensation and administrative expenses. Each category is dynamically weighted to provide a holistic view of the organization’s overall success and durability. This is combined with qualitative aspects of an organization, such as their reputation in the industry, media and news reports, celebrity and influencer endorsements, volunteer feedback, testimonials, and impact stories. Only the nonprofits that continue to meet or exceed our rigorous criteria are included on the ThatHelps website and app.